Stay tuned for upcoming events for Sherazade and LavionRose in near future. 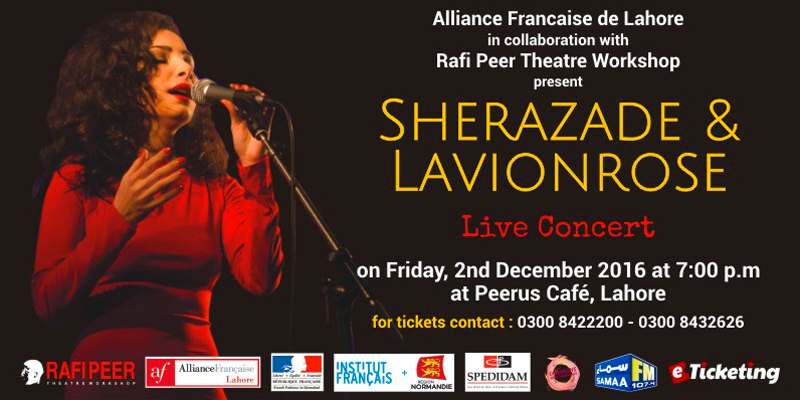 Sherazade & LavionRose - Live Concert will be presented by Alliance Francaise de Lahore in collaboration with Rafi Peer Theatre Workshop on 2 December 2016 at the Peeru's Cafe in Lahore. Russian-Algerian singer Sherazade and her musicians from L'AvionRose will perform from 7:00 PM to around 10:00 PM. Sherazade has three names: Chahrazed Mahia, Sacha and Sherazade Carmen. She sings in several languages like Russian, Arabic, French, Armenian, Azeri, Turkish and English. Her musical identity is deeply rooted in world music and shaped by an influence of varied music genres: Russian and Eastern music, traditional or classical, lyrical song with an affinity for blues and soul. LavionRose are five musicians who have toured around the world playing pop rock blended with world music. L'AvionRose band lineup consists of Sébastien Duval on bass, John Eudes Solignac Lecomte on drums, Manuel Decocq on violin and accordion, Jean Claude Meurisse on piano and vocals, Jerome Eye Saleys on guitar and sound. Sherazade with LavionRose offers new sound textures from urban electric to flavorful and mystic. Their tracks such as Arménia, Palmita, Ocian, Louliya intertwine to draw a contemporary geography, both provocative and seductive. Their songs are a superb blend of world music and pop. Best Viewed at 1024 x 768 pixels and above. This Page loaded in 0.02298 seconds on Tue, Apr 23, 2019 (20:57).